From the website: "For more than a decade, the GCFLearnFree.org program has helped millions around the world learn the essential skills they need to live and work in the 21st century. 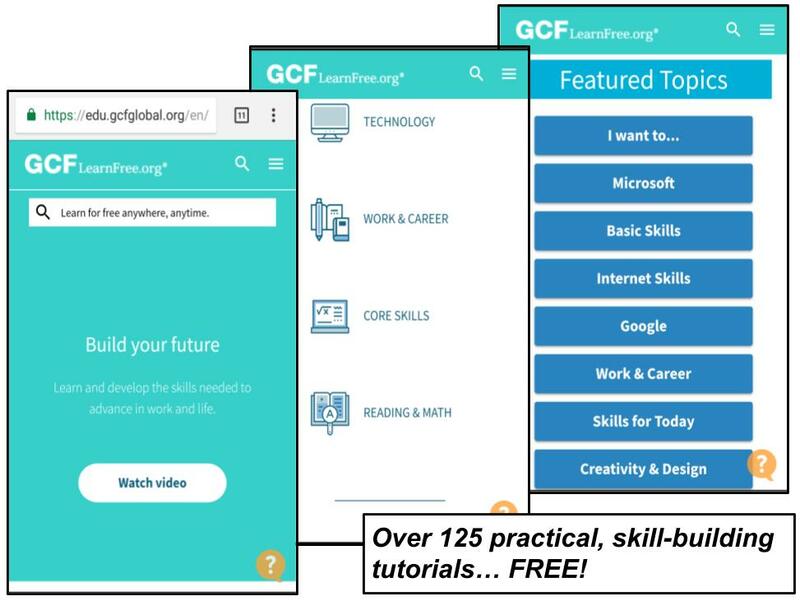 From Microsoft Office and email to reading, math, and more, GCFLearnFree.org offers more than 180 topics, including more than 2,000 lessons, 800+ videos, and 55+ interactives and games, completely free." This list of topics illustrates the wide range of skills you can acquire through this website: Image Editing, GED Prep, The Sharing Economy, Basic Spanish, Office 2010, Google Docs, Android Basics, Workplace Communications, Resume Writing & much more! * The bad news about my "old" video tours listed in these descriptions: A few menus at the websites might have changed over time. The good news: As you'll see in the updated links below, the sites are all still going strong and most of them have added lots of new free stuff! So they are definitely worth checking out! From the website: Academic Earth believes that everyone has the right to a world-class education. [So] we ... curate an unparalleled collection of free online courses from the world’s top universities. ... In addition ... Academic Earth features an ongoing series of original videos [that] tap into our belief that a great deal of learning happens outside the classroom in those unstructured moments when provocative questions are raised, debated, and sometimes answered. We embrace intellectual curiosity..."
Universities represented at Academic Earth include Harvard, Yale, MIT, UC Berkeley & many other top institutions. You'll find courses ranging from Architecture, Entrepreneurship, Literature, Mechanical Engineering, Nursing, Computer Science, Psychology, Environmental Studies, Nutrition, MCAT test prep, Law, Early Childhood Education, Criminal Justice & many more! From the website: "Alison is one of the world’s largest free learning platforms for education and skills training. It is a for-profit social enterprise dedicated to making it possible for anyone to study anything, anywhere, at any time, for free, online, at any subject level. 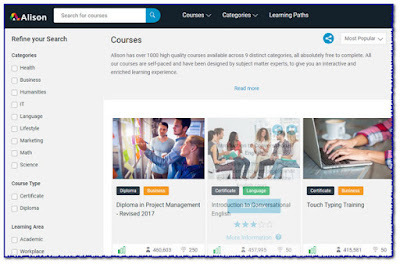 Through our mission we are a catalyst for positive social change, creating opportunity, prosperity, and equality for everyone... Alison has over 1000 high quality courses available across 9 distinct categories, all absolutely free to complete. All our courses are self-paced and have been designed by subject matter experts, to give you an interactive and enriched learning experience." 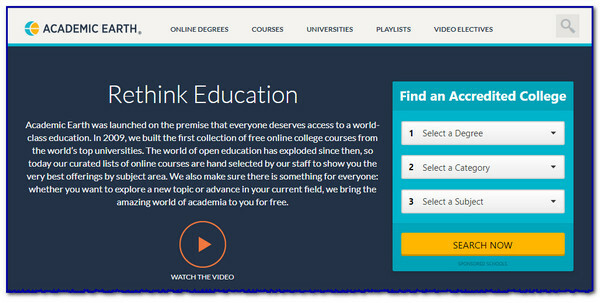 The "nine distinct categories" of free courseware at Alison include IT, Language, Science, Health, Humanities, Business, Math, Marketing, & Lifestyle. From the website: "Our mission is to democratize education through the offering of world-class higher education opportunities that are accessible, flexible, and economical. 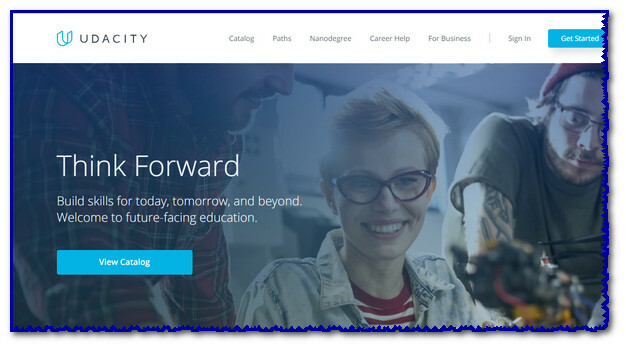 Virtually anyone on the planet with an internet connection and a commitment to self-empowerment through learning can come to Udacity, master a suite of job-ready skills, and pursue rewarding employment." Are you a wanna-be techy? 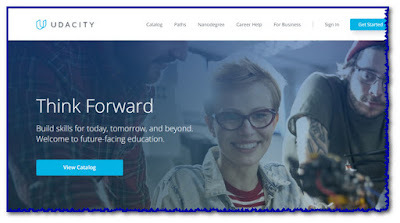 Then you'll want to check out some of Udacity's courses that are available via a partnership with Google. Some of the more popular free "nanodegree" programs include: Intro to Programming, Android Basics Nanodegree by Google, Front-End Web Developer, iOS Developer, Machine Learning Engineer, & Android Developer. Other courses include Flying Cars & Autonomous Flight, Robotics Software Engineer, Business Analytics, Blockchain Developer and many, many more! From the website: "Every course on Coursera is taught by top instructors from the world’s best universities and educational institutions. Courses include recorded video lectures, auto-graded and peer-reviewed assignments, and community discussion forums. When you complete a course, you’ll receive a sharable electronic Course Certificate." 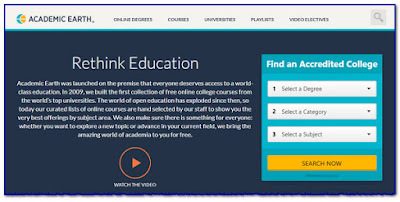 Here's a sampling of some of the free courses available: Becoming a Changemaker, Introduction to Social Innovation, Organizational Leadership, The Data Scientist's Toolbox, Machine Learning Foundations, Linear Regression & Modeling, Dairy Production & Management, The Science of Gastronomy, Emerging Trends & Technologies in the Virtual K-12 Classroom, Understanding Violence. * The bad news about my "old" video tours listed in these descriptions: A few menus at the websites might have changed over time. The good news: As you'll see in the updated links above, the sites are all still going strong and most of them have added lots of new free stuff! 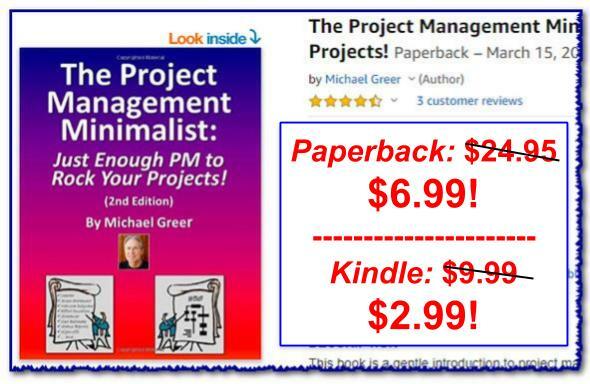 So they are definitely worth checking out!